About Dr. Pribut: Dr. Pribut is a member of the Advisory Board of Runner's World magazine. He is a past president of the American Academy of Podiatric Sports Medicine (AAPSM). He served as chair of the AAPSM Athletic Shoe Committee for 5 years and has served on the Education Committee, the Research Committee, the Public Relations Committee and the Annual Meeting Committee. He is a co-Editor of the current AAPSM Student's Manual. Dr. Pribut is a past president of the District of Columbia Podiatric Medical Association, serving in that post for 4 years. Dr. Pribut currently is a member of the American Podiatric Medical Association's Clinical Practice Advisory Committee. 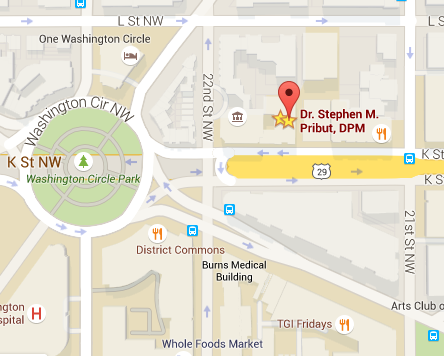 Dr. Pribut is a Clinical Assistant Professor of Surgery at the George Washington University Medical Center.